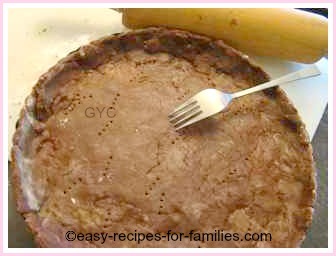 The photo tutorial on this page is for a Chocolate Tart Recipe from A Jamie Oliver Recipe "Fifteen Chocolate Tart". Fifteen is the name of his London Bistro and if you want a recipe to WOW! your family and friends, this is It! To go to the recipe just click on the photo. I've modified the Jamie Oliver recipe as the one in his cookbook "Cook With Jamie" has proportions sufficient for 3 chocolate tarts. Additionally, I simply cannot bear wasting time weighing ingredients, so I've converted the proportions to cup equivalents. 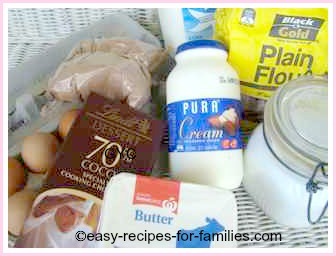 Here are the ingredients for the chocolate pastry and the very luscious chocolate filling for the tart. 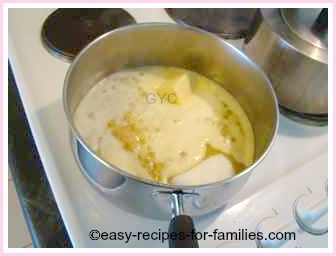 Melt the butter and sugar in a roomy saucepan. Yes, that's right - melt it and combine till thick. Now be careful to take it off the heat immediately as soon as the butter melts. Jamie's recipe calls for the creaming of butter and sugar, but I've found over the years, the process of melting together is so much simpler. 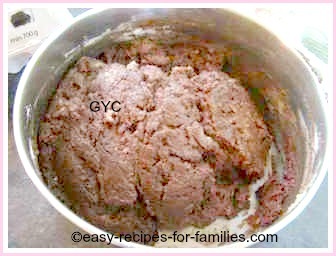 Add in the flour and you'll see it clump together like dry breadcrumbs. Stir in the egg and your pastry will bind together like this. 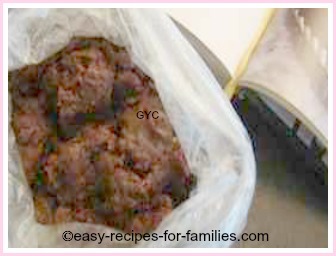 Place the dough into a clean plastic bag and place in the freezer or back of the fridge for at least 45 mins to 1 hour. Be sure the dough is chilled thoroughly but not frozen. 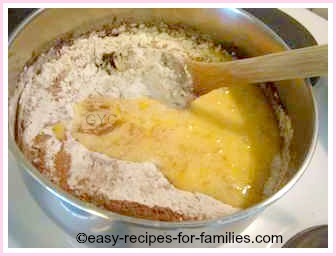 When cooled, roll out the dough and line a shallow non-stick flan pan with a removable base. I found that the pie crust is incredibly short (meaning buttery and difficult to handle) which is exactly the delicious texture you want to achieve. I resisted and did not add more flour nor knead it more as over-worked pastry becomes hard and plastic. So, just do the best you can and use pastry bits to line your flan pan. You can see here, the pie crust shell does not look "neat" but the outcome is sensationally short and delicious. Prick it all over with a fork to allow expansion room and pop it back in the fridge for another 30 minutes. Then bake blind for 15 minutes. ...and allow to cool before pouring in the filling. To go to the next part of the photo tutorial where you'll see each step on how to make the rich filling for the tart, click on the image. 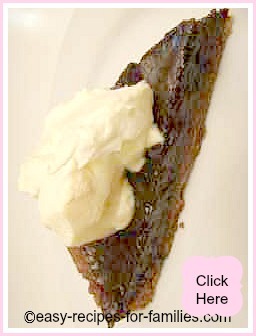 I love this chocolate tart recipe as Jamie Oliver is not precious at all about the making of pastry - hey, the recipe actually has instructions to cream butter and sugar rather than the tedious method of rubbing in butter into flour. Frankly, that's exactly how I make my pie crusts - the easy way and it always turns out short and delicious. Remember, don't over work it unless you want a hard crust. To bake blind, means to bake the dough lined pan without any filling. So, the idea is to bake it as a shell before the filling goes in. Filling poured into an uncooked shell makes the crust all soggy. Be sure to prick the pie crust all over with a fork before baking blind. This gives the cooking pie crust room to expand. This recipe is sensationally delicious and easy to prepare - this chocolate tart is a complete winner! 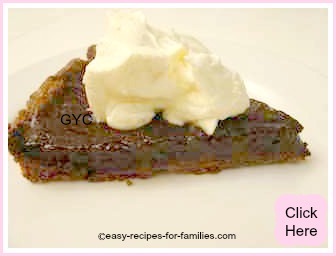 Leave Chocolate Tart Recipe to be inspired by hundreds of luscious easy recipes and wonderful desserts!